Seascape from Deirdre Dyson’s Horizons carpet collection will be presented at Maison et Objet in Paris (19-23 January 2018). The range uses colour grading techniques and a combination of Chinese silk and Tibetan wool to reflect the textures and varying light found in nature. Each carpet is bespoke and can be fitted or freestanding. 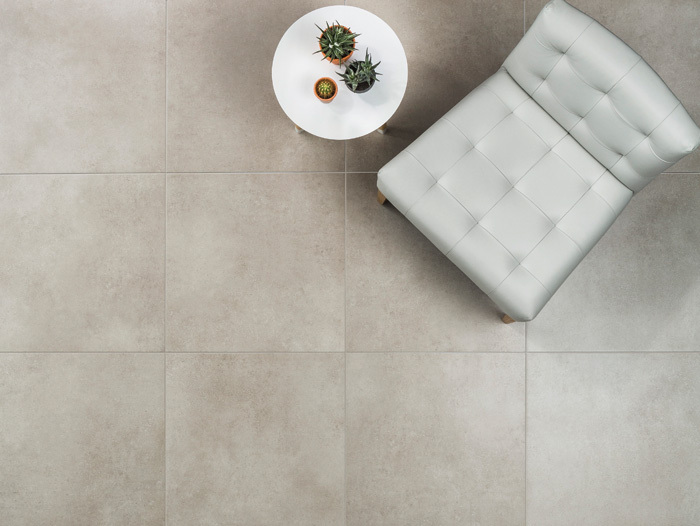 Zen stone-effect porcelain for floors and walls is available in five formats, starting from a 71mm x 280mm wall tile, natural or anti-slip finish. It comes in brown, dark, grey and moon colourways. 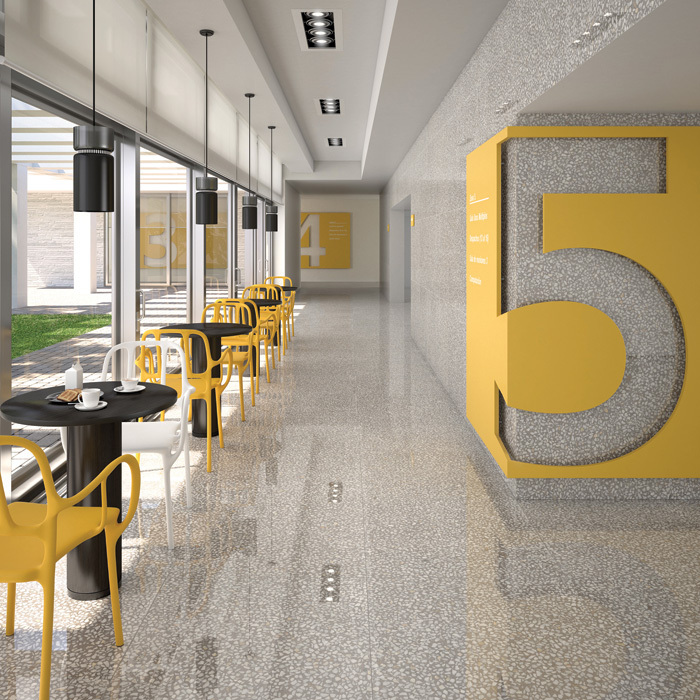 Portofino porcelain wall and floor tiles by Spanish maker Vives features a terrazzo effect in four colours and four formats, and is available with a choice of metallic edges. Frost-resistant, the tiles are suitable for interior and exterior use. 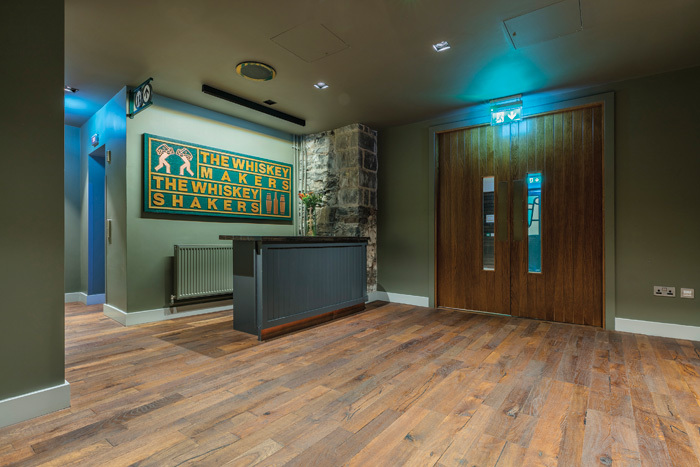 Two wood-floor designs from Kährs Da Capo Collection have been supplied by TileStyle for the newly refurbished Jameson Distillery Bow St, Jameson’s Dublin-based brand home and visitor experience. Located in Smithfield, on the site of the original distillery, the new building combines whiskey tasting with ‘state-of-theart storytelling techniques’. Its €11m redevelopment was led by BRC Imagination Arts, Dublin-based architecture practice The O’Toole Partnership, and main contractor, Flynn Management & Contractors. All Kährs flooring was installed by Floor Form (Ireland), from Dunboyne, Co Meath. During the visitor attraction – attracting some 300,000 tourists a year – the original fabric of the listed building was protected and historic findings managed. Kährs designs Oak Domo and Oak Unico were selected as each reflected the building’s heritage and rustic interior, with timber elements including existing truss beams, bar areas, barrels and shelving. Both floors have a lively, rustic grain and are brushed, smoked, hand-scraped and bevelled to give a vintage finish. The installed floor area spanned more than 230 sq m and included ‘The Ticketing Hub’; the Water Tank Building lobby, Welcome lobby and Craft Experience Welcome lobby; the Maturation Warehouse corridor and a secret tasting bar, called JJ’s Office. 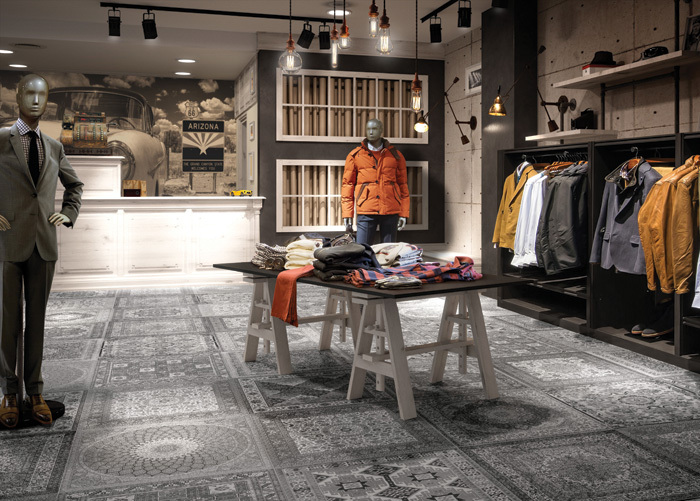 Aparici’s porcelain tiles from its sq Kilim range give the effect of rugs and are perfect for a cosy effect in a retail environment. Kilim by Aparici comes in a choice of three rug-style designs and three colourways in a 60 sq cm format, but has all the benefits of durable and easy-to-maintain porcelain tile. 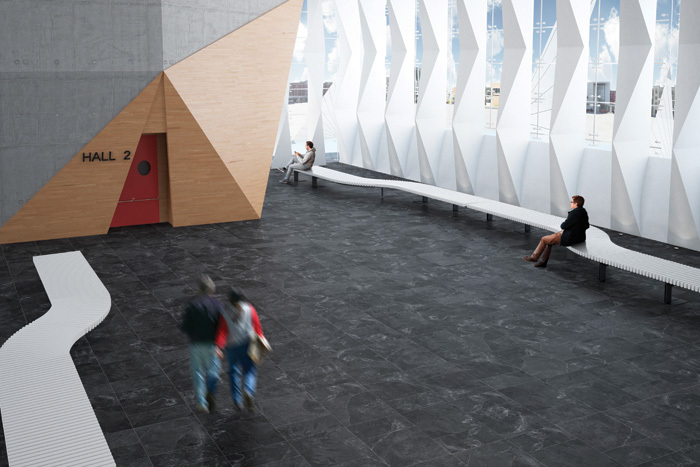 New from Johnson Tiles is Enstone, inspired by a village of the same name. Replicating Cotswold Stone, it is available in one size of 600mm x 600mm, and its palette includes two tones.